Johnny Linden: Thank you Joe Dobson so much for posting this picture. I can tell you exactly who these people are. That's the front porch at 2804 Dirr. 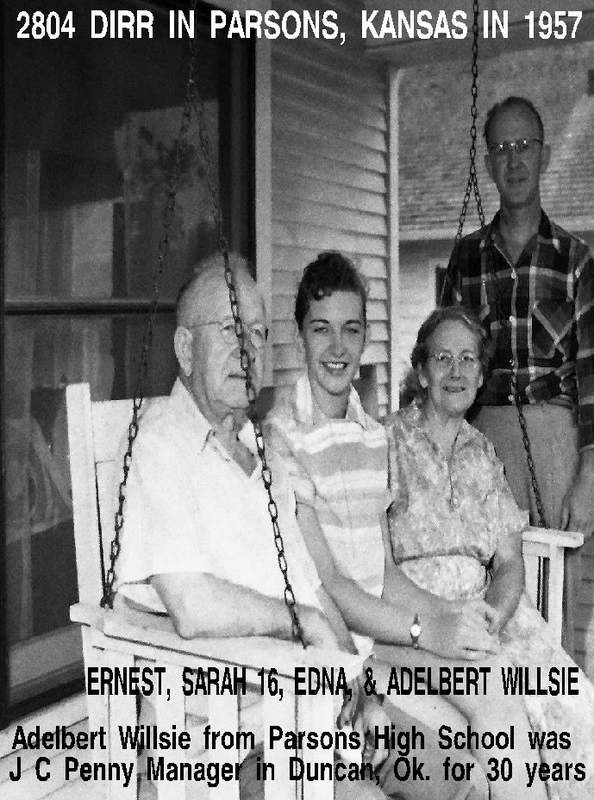 That's my Grandpa that worked in the MKT shops building steam locomotives, Ernest Willsie, and my grandma Edna Willsie. Their son Adelbert Willsie Parsons Vikings basketball player in the 1920's, and J C Penny manager in Duncan Oklahoma for 30 Years. That's his oldest daughter, my cousin Sarah Willsie, who's husband, John Dye, designed the liquid oxygen jet propulsion systems on the Apollo moon rockets. Sarah graduated from h. s. in 1958.